Seriously, I thought I understood at least where my country stood as far as international GDP per capita considerations were concerned, at least until I took a serious look at this chart. 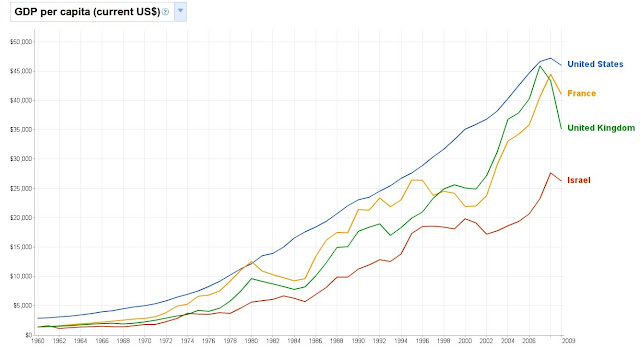 This chart compares the GDP per capita of four countries from 1960 to 2009. The countries are: Israel, UK, France and the US. Until I looked at the chart, I thought I had it all figured out: we were a developing country, slowly gaining acceptance and status, and improving our GDP, and GDP per capita. One day we will catch up with Europe and the US, and in the past we were much farther away from them then we are now. This chart says that in 1960 UK, Israel and France were all in the same spot! Roughly one half of the US GDP per capita at the time. Wait, there's more. According to the chart that (1960) was the last time Israel was doing so well at least compared to the UK and France. And these two grew faster than Israel, almost catching up with the US recently. What is the meaning of this? How can this make sense? Is the UK doing better than France recently? If so is 2009 just a blip? Can blips be really this big? Why was France doing so much better than the UK in 1980? Why the same in 1994? I bet that there are great explanations for all of these questions. A good starting point is that since 1960 Israeli population has more than tripled, whereas UK and France almost did not grow. But that leads us to what I wanted to say from the beginning: GDP per capita is just one number, if you look only at one number you will be confused, and you will not be able to tell the whole story!